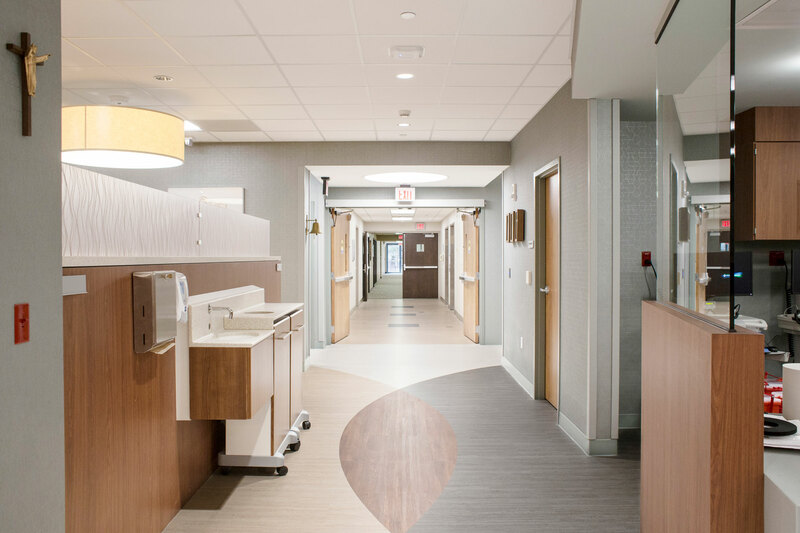 The new infusion center involved renovation of 9,700 square feet of the former St. Elizabeth Health Center outpatient surgery center. 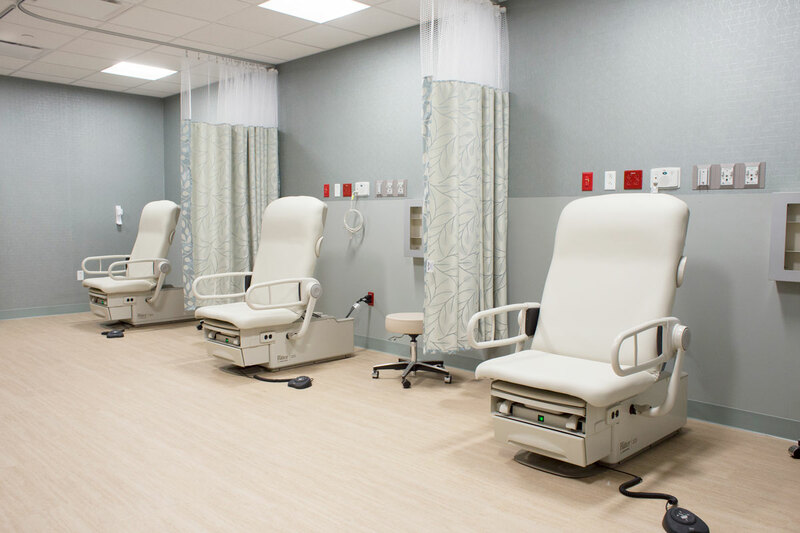 This renovated space is to focus on health, comfort, and aesthetics.The new center consists of 12 patient bays, a treatment room,a fast track and 4 exam rooms. 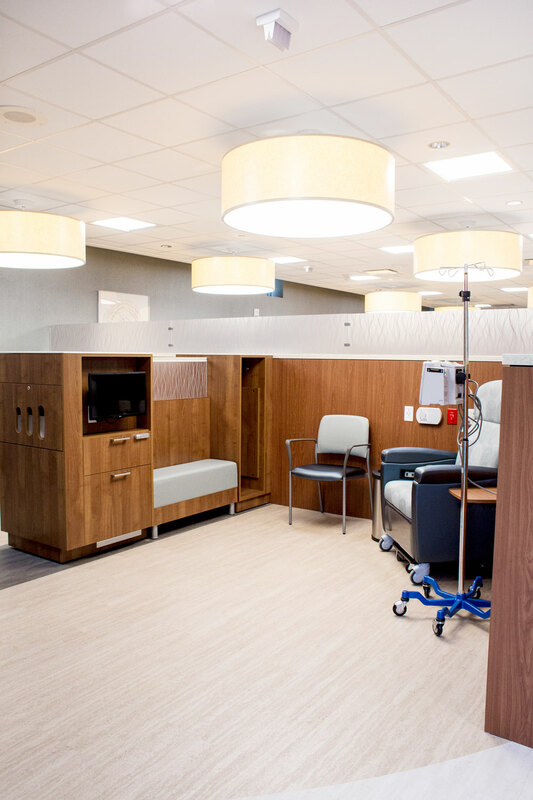 A central nurse station, an onsite pharmacy, staff offices, as well as other support spaces are also provided. The on-site pharmacy includes a workroom and a modular Cleanroom in compliance with USP 797 and USP 800 Regulations. The Cleanroom consists of a storage, an Anteroom, apositive pressure Cleanroom and a negative pressure Cleanroom. 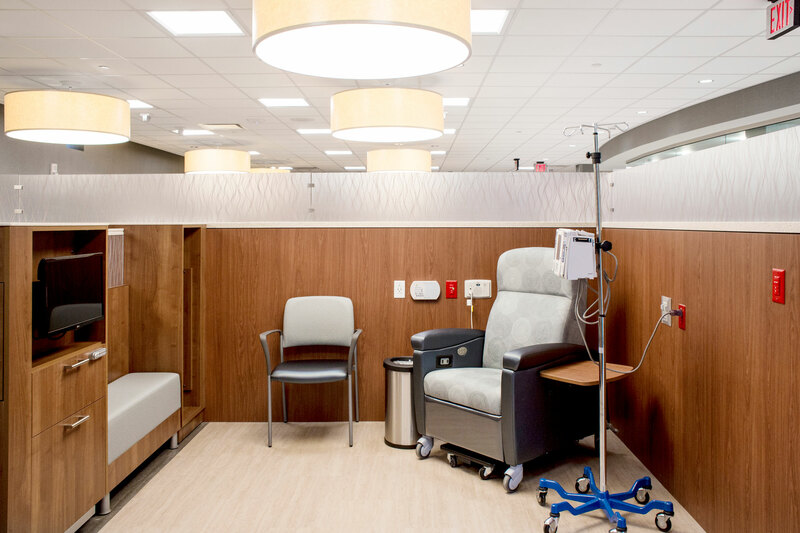 The layout of the infusion area was designed to allow for privacy or socialization when desired. The bays are grouped in such a way that the central bays are more open for socialization while the end bays offer more privacy. Visibility from the nurses station is critical and was well considered by deliberately arranging the bays around it. 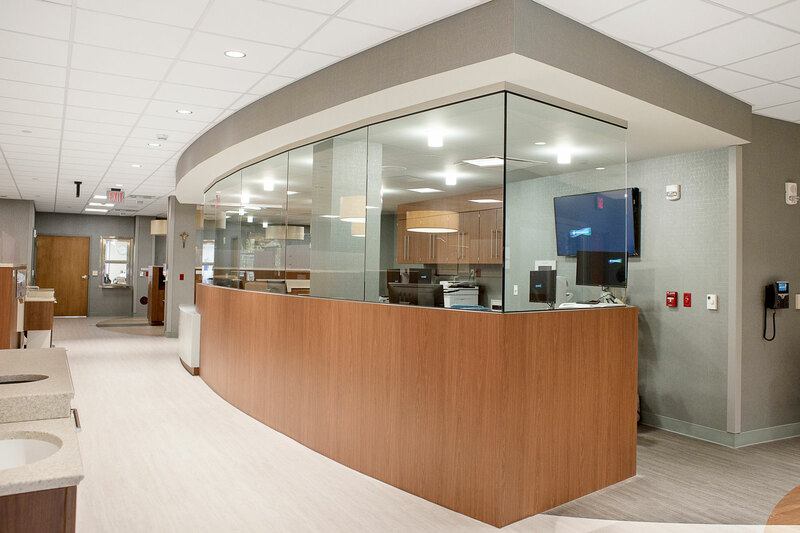 Translucent resin panels are used on top of solid low wall partitions, which create an airy open space while providing visual and acoustical privacy. The individual infusion bay is spacious. 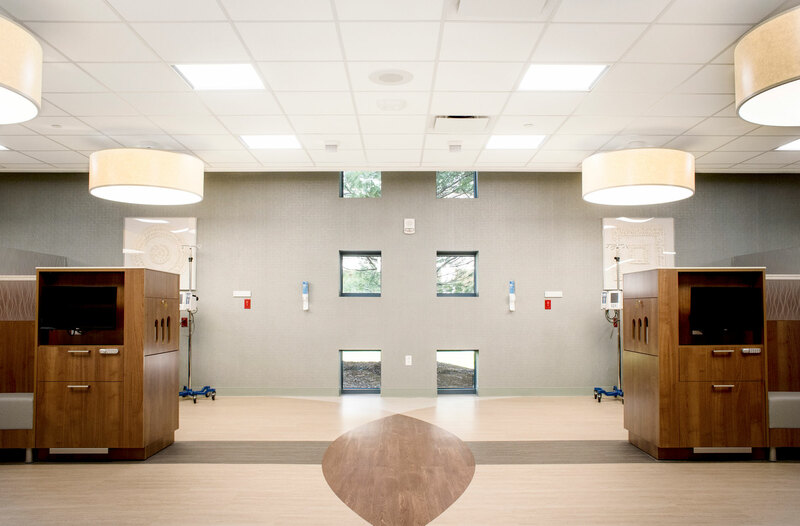 It provides enough room for nurses to maneuver and for patients to transfer in and out of furniture and space easily. Space for family and friends is provided in each bay to promote social integration. Each bay is equipped with ample electrical outlets at sitting height. Space is also provided for storage of personal belongings. Hand-washing sinks, antibacterial gel stations, sharp containers and waste receptacles are all carefully designed and integrated into the furniture and partitions at each bay, to help reduce the spread of infection. 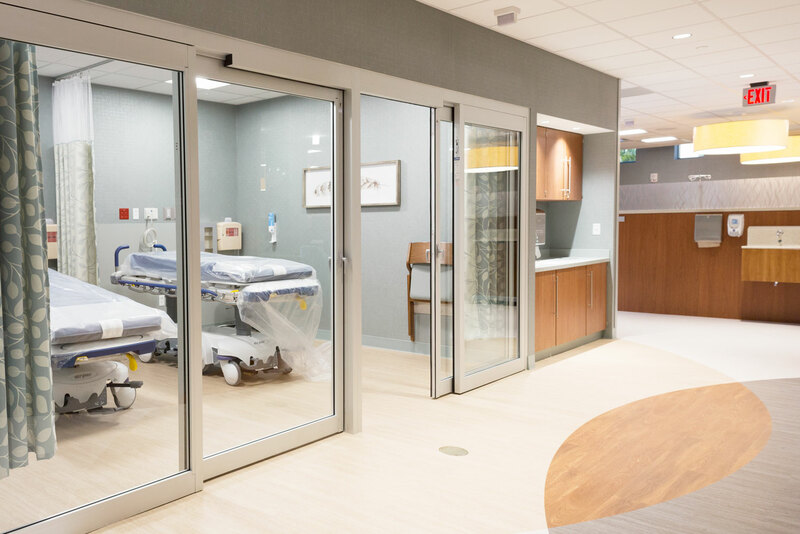 To create a relaxing and comfortable healing environment for patients, new window openings are introduced to the space to allow patients’ exposure to natural light and outside views. The ceiling is raised to help natural light infiltration. To achieve the desired ceiling height, MEP were carefully coordinated to fit duct work into limited existing ceiling space.